I can`t shake my head at your ignorance because I know the word either, until 2 minutes ago. We`ll call it our: Word of the day. 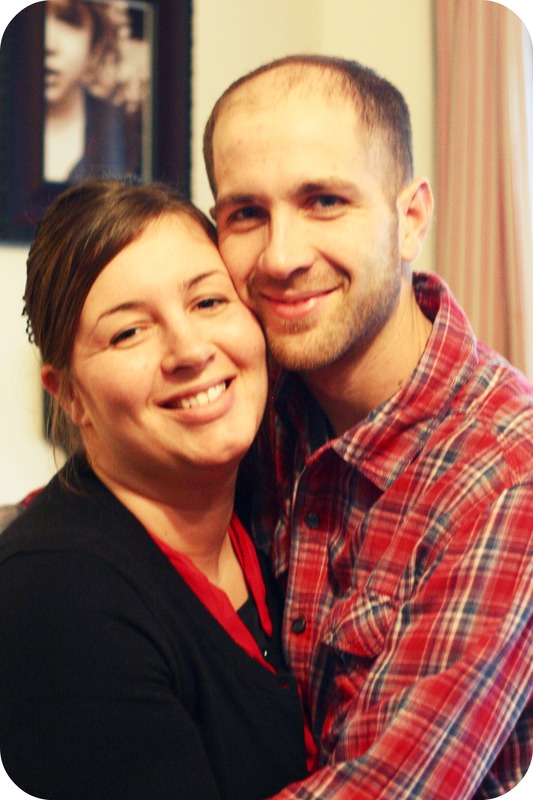 The following is a dumping off of pictures from my camera I just unloaded. A few weeks back, G and I headed out on a fun date night. Laila`s outfit of the day. 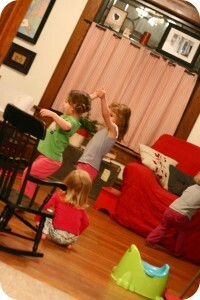 A potty, an eager spectator, and 2 dancing belles. One night G walked to the gas station for the paper, and took the girls as they were. 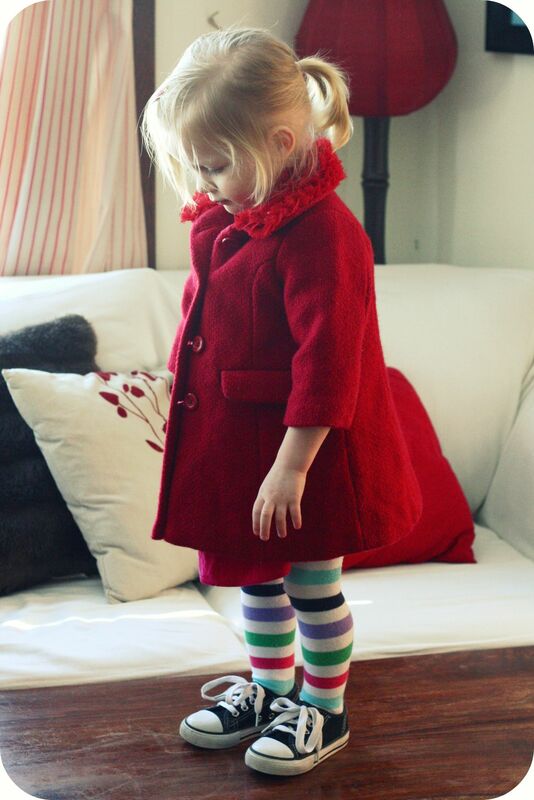 Coats over `jammas. Laila in all her snuggly, nippy-ed glory. 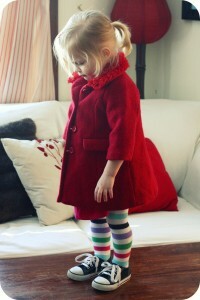 I ♥ little red coats. 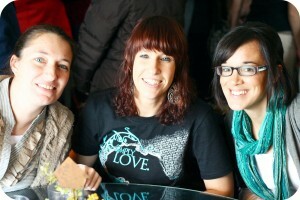 Fun lunch with Shelly, Carissa, ξ Erika. 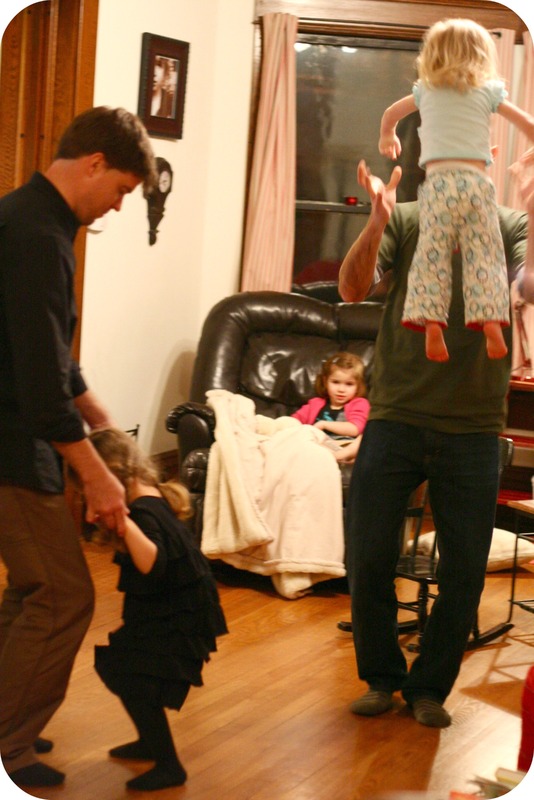 While the Goods are nailing down the polka, they fail to see the Kauffmans have already mastered LEVITATION. Kid`s birthdays after Valentines day. 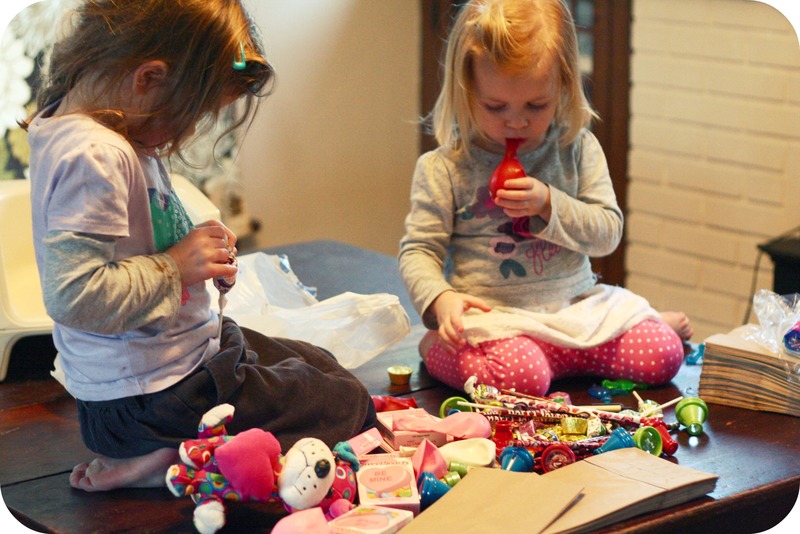 Clearance trinkets from V-day for birthday goodie bags. Yes, please. 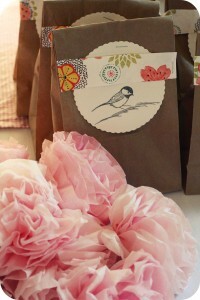 Little brown bags with embellishments I had. All free. Yeah, it wasn`t the greatest birthday party ever. My hus is gone for 4 days. I hate when he leaves, yet I like it too. No supper to cook, no socks to pick up, and there`s never hair from shaving in my white sink. 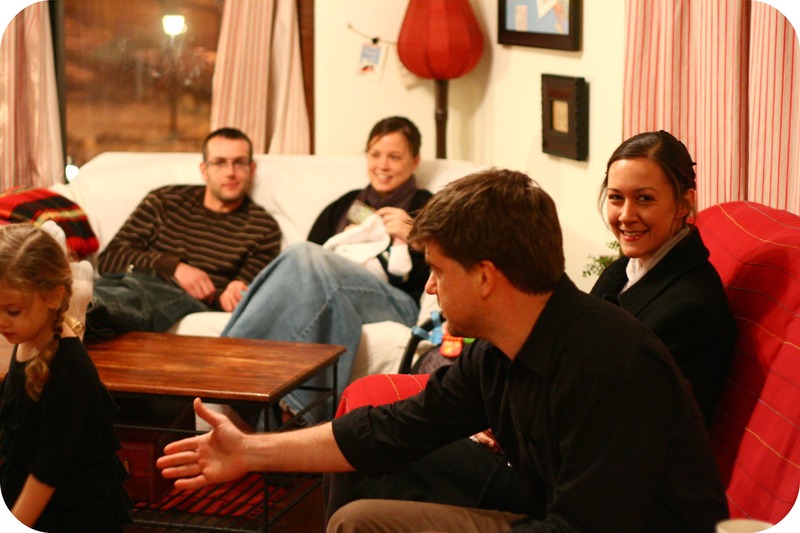 I usually use the time when he is gone– to do projects or “extra things” I normally wouldn`t have time for. Of course the girls and I always get a movie and pizza too one night– just the little ways we spoil ourselves when the man is away. Anyways, well today is Day 1 of him being gone and I was itching– is it only Mennonites that say itching in this context? I want to know– to go shopping and pick out fabrics and notions and just browse in a Joanns-type store all day long. But since the remaining 2 days he is gone are full of fun-ness, I felt too guilty to run around and burn gas today also. 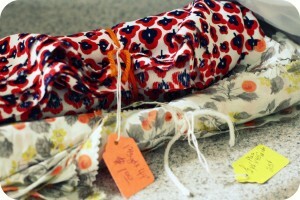 I have recently been super inspired by the dar-A-ling pictures that Thelma had on her blog of her sewing. I have always loved to sew creatively, but rarely do these days. I was hankering for some fabric, so to Save and Serve thrift store I went. They always have great old vintage fabrics there. With a big imagination and wandering eye, MAYBE I could find something sewable?? Among quite a few bins of remnants I found the two, above. For $1 and 25¢, I might add! They are only okay, not awesome. But they will do. Both fabric pieces are very old, when I ironed them I smelled sweet old ladies, and the faint smell of the 1950s…. It was like taking a trip. After that I headed to Walmart for “notions”. No big city fancy stores for me today. I bought ribbon and thread I thought might be cool. Another of my finds at the thrift store– I just had to share the excitement. 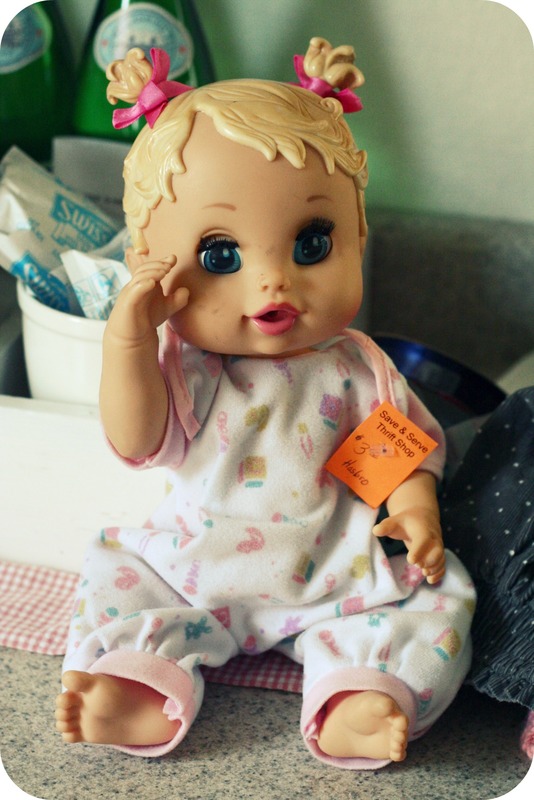 At first just looks like a gross old doll, right? 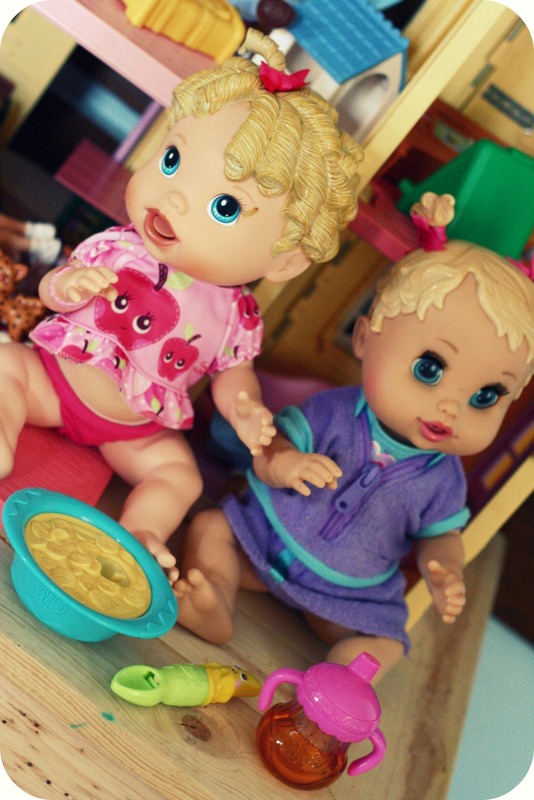 She was laying in a bin with other ratty dolls, her face marked with child-induced smears. I could see by her features though, that she is from the same family as the doll we just bought Laila for her birthday. And Laila`s doll was $25 ridiculous dollars. 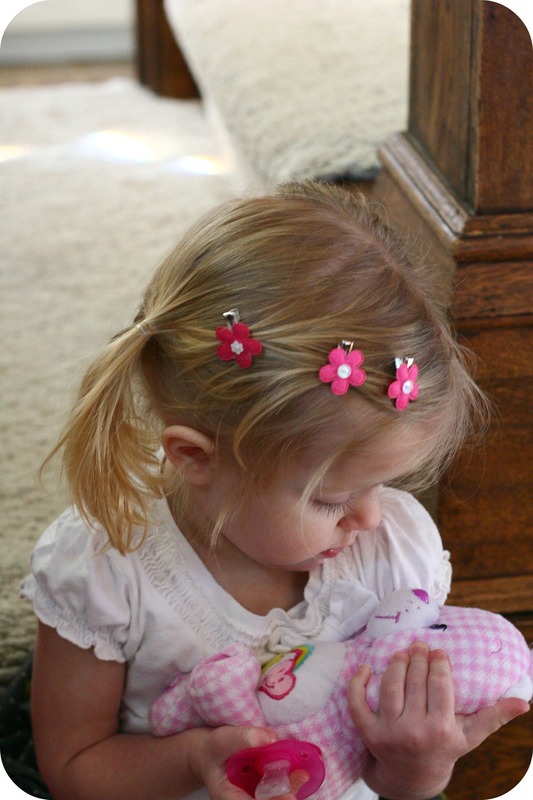 When I cleaned her up, and put a more modern outfit on her– she was JUST AS COOL as the doll beside her– the one Laila got for her birthday. Way cool. I wanted one for Elle too– but wasn`t about to fork out another $25 ridiculous dollars to get her one. Can ANYONE, and I mean ANYONE top Boden in the creative department? A newspaper-like catalog– who`da thunk it. 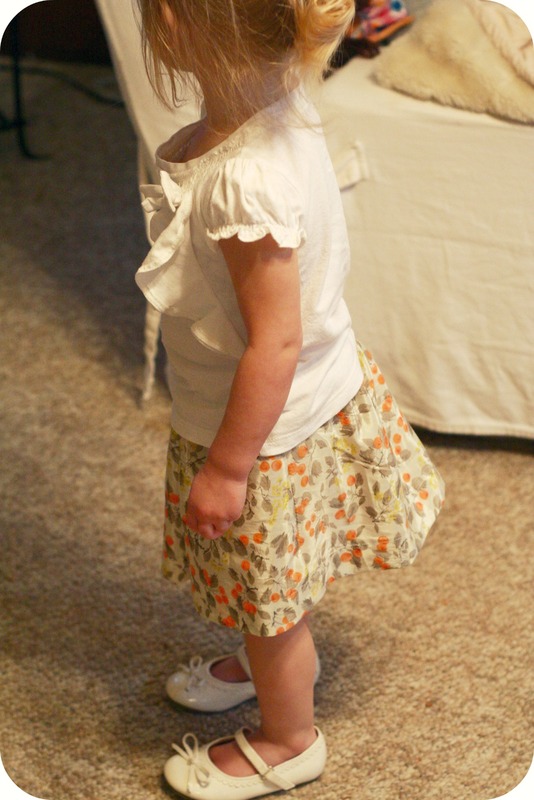 I made 4 skirts so far, with the fabric I bought, but only have pictures of the one skirt. Maybe I`ll get pictures of the other ones later. There`s nothing quite like using your scissors to cut fabric that hasn`t been touched in probably 20+ years. In other news, A huge thank you Emily Smucker for chosing Baileyandme2 as a blog worth mentioning. I felt unworthy. If you have never checked out her blog– you should– she is as funny and talented as they come!! You can think of me. It`s probably me but my girls have opinions lately, and imaginations (which yes I am happy for) but wow, can they ever tear it up in a big way. 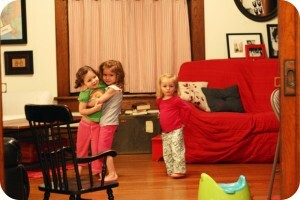 When I tuck them in at night, I am just dead tired of dealing with whining, tantrums, spills, dumped toys, more messes. Yeah today wasn`t the greatest day ever. They really are so sweet. I think it was just a rough day. hmmm…here i sit in my quiet abode while my hubs is gone. but, just for the evening. i know about that urge to do some things while my hubs is away….when he’s gone for any length of time (as in overnight, multiple nights) my to-do list is ridiculously long! i’ve tackled all kinds of projects when it’s just me and the kiddos….what is it about not having to fix supper, or clean up, or care much how you look that makes a person kick into high gear?! weird. super! 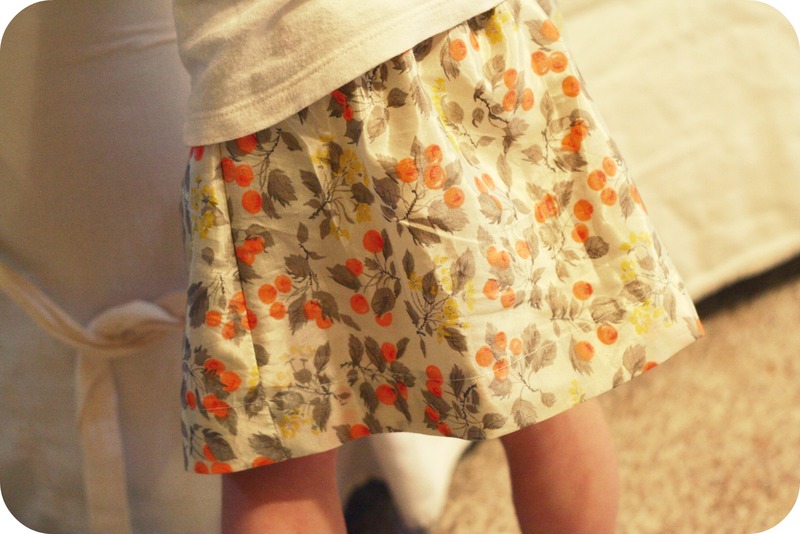 cute little skirt for your girlie!! 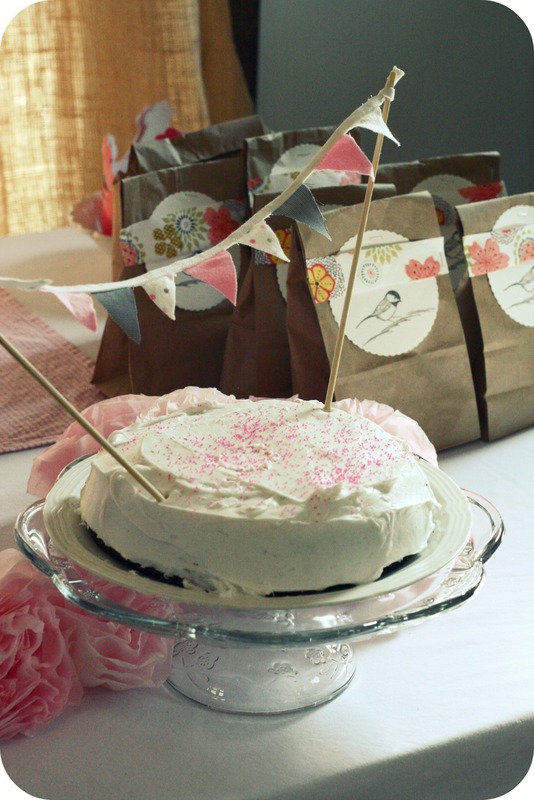 and, all the little details of the birthday party…happy sigh. i love details, and yours are ever so nice! Could not count how many times I went to bed with all the toys all over the house ( Karis thinks my tiny kitchen is surly the place they all belong!) The skirts are very adorable I’m Berry ready for warm weather and cotton skirts instead of coats and tights! And I do the same thing when Joe is gone. Extra cleaning, appointments that have been pushed off to long, etc. 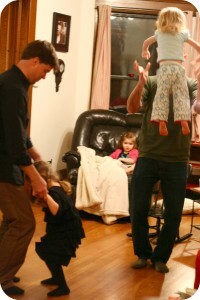 The kids and I always do a couple fun things too. You guys do pizza and a movie. We do Wendys and a movie. 🙂 I actually have to watch myself that I don’t try and do so much while he’s gone that I end up in a heap of utter exhaustion by the time he gets home. That cake was so simple and pretty – my kids always insist on me making some tacky cake that turns out even tackier than the picture, so enjoy the time that you can just decide yourself. There is almost nothing I love more than to turn an old piece of fabric/clothing into something useful and cute again. I seriously almost get a high when I find something like that. I really love the skirt and the fabric. Know what you mean about loving it and hating it when the hubs is gone. I always get a ton of stuff when he’s gone! Loved the banner on the cake. Filed that idea away for a future use. Happy sewing. 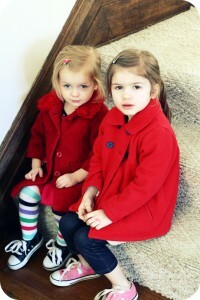 I wish my girls needed more clothes right now because I would love to sew and sew for them. Alas, I suppose I’ll have to attack my less fun projects right now. hey jenny. love the little skirt.. darling darling darling. also love your hub bub life. 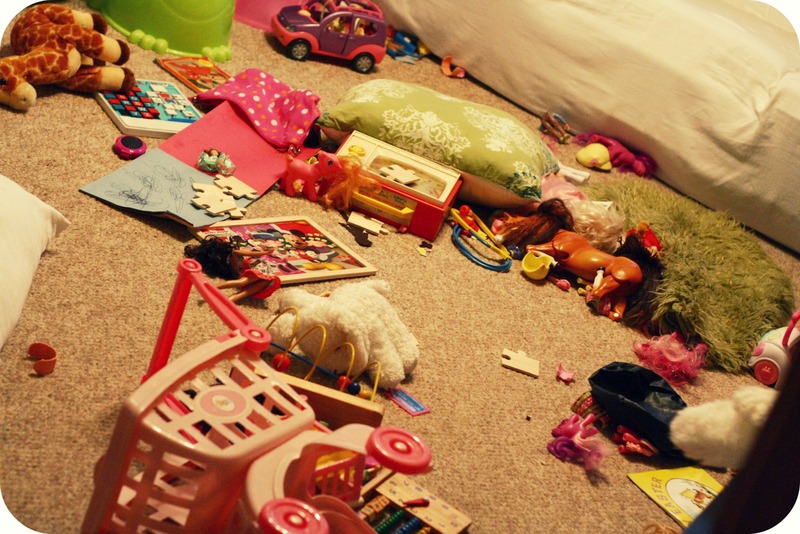 all the toys on the floor. your girls have a great mom. i’m proud ofyou. wow wow wow. you did it again. i love the skirt! 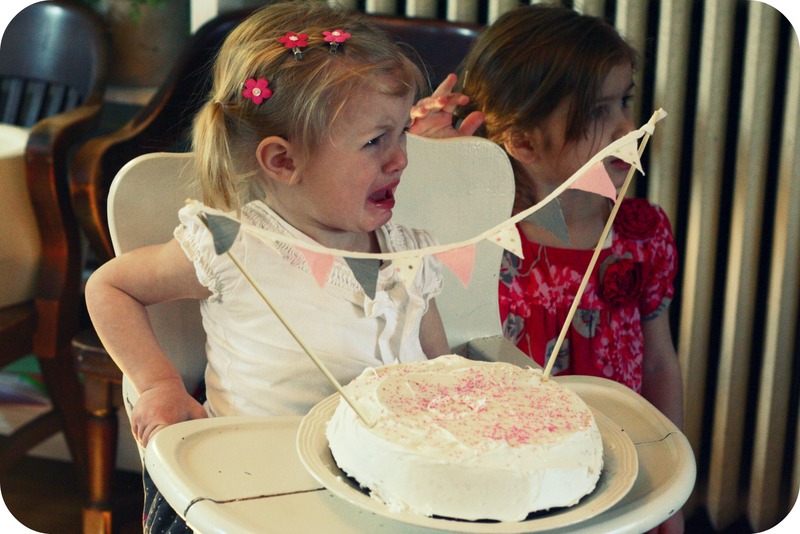 had to laugh out loud when i saw the pic of layla crying on her birthday and you said this is pretty much how the day went:) love the deals you got on kids clothes and the adorable doll! love you! Yep, new word for me too. 🙂 It’s a good thing to keep this mommy-brain rolling! can i just say your last paragraph and picture could have come straight from this house…..only, i have about 3 rooms that look like that right now. and yes, i go to bed without picking up. today is gonna be a clean house good, really good kind of day. can’t wait to get to the sewing machine myself. cute skirt. 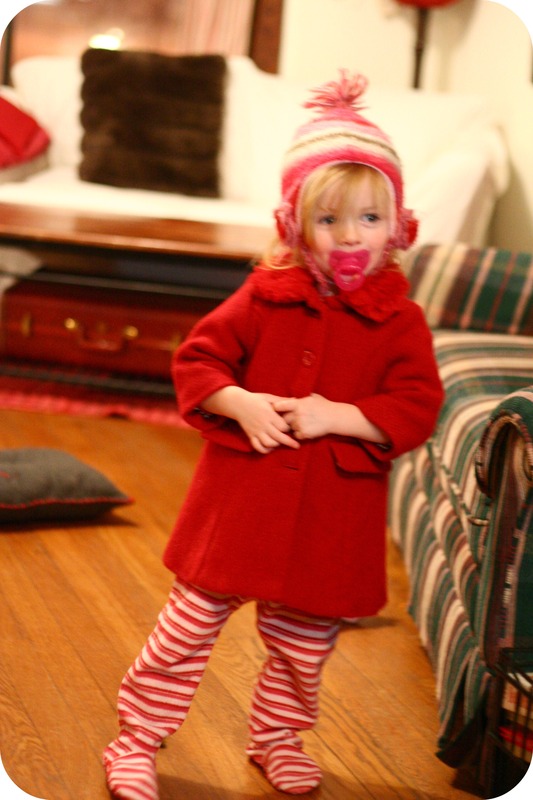 oh and, love those little red coats. saw them around in stores but never found any cheap enough for me to buy. lucky you. I hope you sit down at the end of a day/week and thank God for the creative and humor-filled mind He’s given you!! 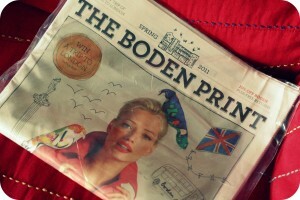 Yes, Boden WINS. JCrew is a close second, if not a tie. LOVE the little skirt. 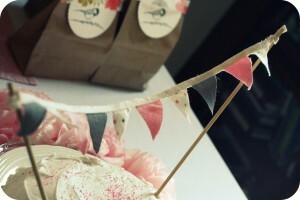 Will be filing the banner cake away in my brain for a future kid birthday. I must say, now that my kids are older, it is an even more enjoyable time when Ed is gone. When the cat is away, the mice *pa-lay*. They are not so maintenance filled at this age. It’s fun. So, hang in there. thanks a lot, julie. i found that very encouraging! i wanted to add that my favorite way to browse j. crew is to google “j.crew” and then click “images”. i like it better then the actual j.crew website because i get to see PICTURES GALORE from all different years. ooooooh, I will have to do!! I can only afford to shop at the J.Crew outlets, but man, do I LOVE ’em!!! Was it Kristy? Another blogging gathering?